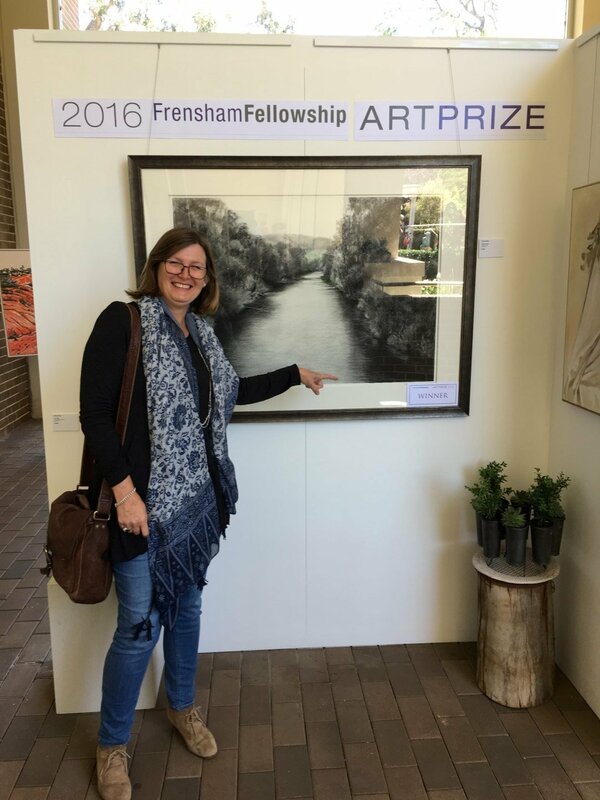 In November I entered one of my large charcoal drawings, ‘The Paterson River’, into the Frensham Fellowship Art Prize ( Old girls) and much to my total shock and delight I won! I always find it an odd feeling returning to school…it is so familiar yet it seems like a life time ago. I was particularly thrilled to win the prize and know that my work will be hanging on a wall somewhere at the school, as it was at Frensham that I truly become passionate about my art and my time there was the catalyst that started me on my art journey. ‘Paterson River’ by Nicola Bolton is a remarkable work, exceptionally well executed in charcoal on paper, one of the most difficult mediums in which to articulate, clear depictions, particularly of detailed landscape features. This drawing is a striking and skilful representation of an area west of Nelson Bay, the river winding its calm, perpetual way through the Australian landscape, between trees, shrubs and grasses, all beautifully drawn, towards distant hills. The artist has captured perfectly the sense of composure and tranquility, sustaining the notion that colour is not a perquisite to forming the impression.